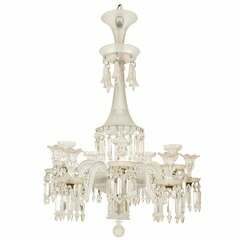 Signed by Osler, this three-tiered crystal chandelier dates to nineteenth century England and features thirty-six candleholders branching out from the stem via s-form glass arms that terminate in clusters of crystal prisms. 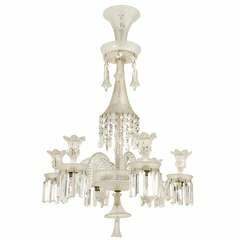 (Signed: Osler) The firm of F & C Osler of London and Birmingham, were the leading makers of chandeliers and lighting during the nineteenth century. 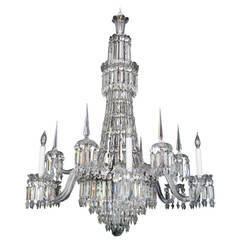 The glassworks were founded by Thomas Osler in 1807 in Birmingham and specialized in glass furniture and chandeliers for the overseas market. Thomas Osler was a scholar rather than businessman but when his sons (Follett and Clarkson Osler) joined him in the business they complemented his skills with their energy, which saw the firm thrive and a London house being opened in 1845.F. 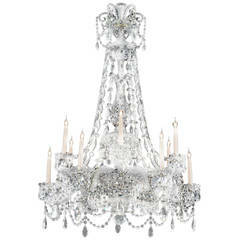 & C. Osler were the leaders in their field and took the art of 'Brilliant Cut Glass' to new heights. 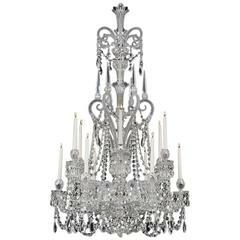 This 'brilliant' style emerged in the late 1870's, its name aptly describing it's effect. At its most complex brilliant cutting involved covering the glass surface with intersecting cuts that created innumerable, often fragmentary shapes making up larger patterns. 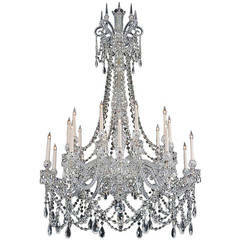 Basic motifs used were stars, hob-nail or polygonal diamonds, strawberry diamonds and fan scallops, out of which a dazzling surface effect was achieved. 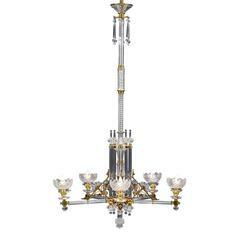 During the 1880's F. & C. Osler produced ever more complicated designs in this style. 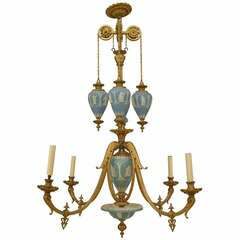 English Adam style chandelier composed of four scrolling bronze dore arms and suspended blue and white decorated Wedgwood urns bearing company hallmarks.